Want an electric car but don’t want the range anxiety? 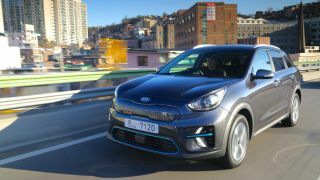 It seems hard to avoid the slight air of tension that involves driving a battery-powered vehicle, but Kia’s doing a decent job at alleviating those fears with its e-Niro mini crossover. Boasting a 64kWh battery, the Korean car manufacturer claims that it will come with the ability to cover 282 miles (455km), which is pretty impressive for the new long-range model. The stats, incidentally, come from the Worldwide Harmonised Light Vehicle Test Procedure (WLTP) and real world driving habits and conditions will obviously distort those frothy numbers. Nevertheless, the e-Niro First Edition, as it’s being billed, is arriving in the UK next April but while Kia is giving the range anxiety aspect a run for its money, the downside to having a beefy (and pretty hefty 457kg) battery is the charging time. At home, with the luxury of an overnight rejuice via a 7.2kW charger, you can replenish the chunky battery in about nine hours. Expect to wait just under an hour for an 80% recharge, reckons Kia, if you can access a potent 100kW power source. Meanwhile, more common middle ground charging from the likes of service stations will deliver 80% in about 75 minutes from a 50kW outlet. You can, however, also attempt to squeeze optimum performance from the available battery power that you do have by enlisting the help of the paddles on the steering wheel. In essence, these allow you to change the amount of regenerative braking that takes place and, while it doesn’t appear to be perfect, things are going in the right direction. And, in the same way as Nissan’s Leaf with its wonderfully addictive e-pedal has made driving an electric car entertaining, the results should get better the more you use those paddles. Similarly, in much the same way as Nissan has done a great job of making the latest incarnation of its Leaf look like a ‘proper’ car, Kia’s designers have done a great job with the e-Niro too. They’ve deftly carved the front end to look cool enough to be appealing, but also make it aerodynamic enough to cope with the bulk of lugging a bulky on-board battery around. There are sporty 17-inch wheels while out at the back it’s less distinctive, but the smooth curves help the e-Niro cut through the air quite nicely. The top speed of 104mph is more than adequate for the kind of car this is, but the 0-62mph time of 7.5 seconds is more impressive. It also reminds you of how instant the power from an electric motor can be. The single motor inside the engine bay of the e-Niro First Edition packs 201bhp and 395Nm of torque and is therefore pretty good at covering most bases when it comes to the sort of runs this little car is going to be doing. You might even have a little bit of fun putting it the front wheel drive machine through its paces, albeit in a silent non-tyre-squeeling fashion. We also like the look of the tech on offer within the confines of the functional rather than fantastic interior. The dashboard is a bit meat-and-potatoes standard, but the technical specification makes up for any average-ness in the looks department. You get a dinky rotary gear selector along with the now seemingly unavoidable touchscreen (eight inches, no less) that shows off sat-nav to good effect. Plus there are parking sensors and a reversing camera for anyone still getting used to the pokiness of the electric motor and who wants to take things gingerly. On top of that little lot there is compatibility with Android Auto and Apple CarPlay, along with a DAB radio and your tunes can be played through a decent 8-speaker JBL system. For added convenience, the Qi wireless charger supplies power to your gadgets. Oh, and there are (heated) leather seats thrown into the equation too, which isn’t the first thing you expect from a humble little Kia like this. Other tech trickery comes courtesy of forward collision warning and lane keeping assist. That said, the e-Niro First Edition isn’t that little either, especially when it comes to interior space. There’s enough seating for five people, and the trunk space is especially impressive at 451 liters. There’s space for stashing the charging cables out of harm's way too, which is good news for anyone who has found out just how grubby these things can get over time. In fact, the Kia looks like it’ll be perfect for all sorts of people, from families to students and for transporting everything from the massive weekly family shop through to moving all your stuff from home to uni and back again. All that comes at a price though, which is going to be a sizeable £32,995 (about $42,000, AU$58,000) and that’s after you’ve enjoyed the EV car grant deduction too. So it’s not a bargain, but it is a great car. Backed up, of course, by that universally appealing seven-year/100,000 mile warranty, which is the sort of thing that has made Kia models so popular with UK and US owners already. Crucially, that warranty says Kia also covers the electric motor and battery. Very reassuring.